"I feel so fortunate to be in a profession that not only allows me to take care of patients but to also create lasting relationships with families in my practice. My practice philosophy has always been based on providing quality dental care in a setting where patients are empowered to make the best decision about their treatment." Dr. Negar Sherkat has been practicing dentistry for over 20 years. She always strives to inform her patients on the state of their oral health and advise them on their treatment options in a compassionate setting. This creates an environment where each patient feels comfortable with the care he or she receives. Dr. Sherkat is passionate about the integrity of her profession and the quality of dentistry in Washington. She is a part of several study clubs and takes continuing education courses continually to keep abreast of the latest research and technology in evidence-based dental care. 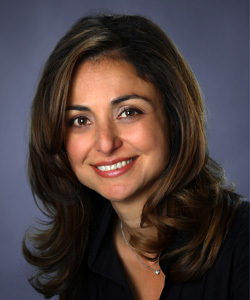 Born in Iran, Dr. Sherkat grew up in Canada and moved to Washington to complete her education. She has been a member of the Bellevue community since 1998. Dr. Sherkat and her husband have two children. Her family is her top priority, and she spends her time outside the office instilling the importance of volunteerism and giving back to the community in her children. Dr. Sherkat’s own community involvement includes volunteering for Donated Dental Services and local homeless outreach. She also enjoys all outdoor activities, especially skiing and hiking.